Complete mini greenhouse systems are designed with you in mind. This complete mini-greenhouse system is designed for high-growing plants. Dual-vented dome is 6-1/2" high to provide plenty of headroom! Heating mat provides gentle, even warmth and controls humidity. 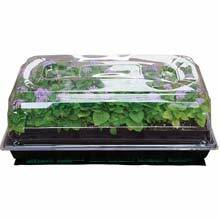 Includes 11" x 22" watertight base tray, 72-cell seedling insert, and instructions. 17 Watts, 120V, 9"W x 19.5"L seedling heat mat. Complete growing system jump-starts your seeds with gentle, even heat. Waterproof heat mat ensures greater growing success. 2-1/2" humidity dome helps maintain climate control for fuller growth. 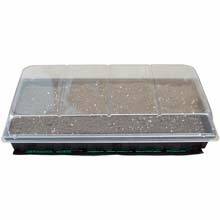 Watertight base tray is 11" x 22" with 72 cell seedling insert. PROFESSIONAL RESULTS WITH ACCURATE AND EASY-TO-USE SOIL TEST KIT. 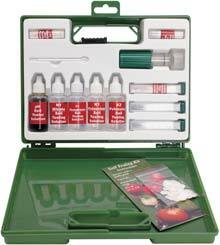 Ideal for use by the home gardener, professionals, in the classroom or in the field. Contains liquids and equipment to conduct 40 test. 10 tests each for pH, Nitrogen, Phosphorus and Potash content. Includes complete instructions and recommendations to amend soil, based upon test findings. Packaged in durable, plastic carrying case.